Reload opened its doors in 2013, with a simple ethos: keep it natural, make it simple, do it well. Using this as a guide, founder Kilaan and a dedicated team, created a much- loved brand in Blouberg Cape Town, which was inspired by the love of nature and the essence of Africa. Reload opened its third branch in March 2017 in Sunningdale at Leadville Park. A wonderful location for dog lovers who wish to bring their dogs to socialise in the park while their “parents” enjoy a delicious breakfast lunch or afternoon coffee. Exciting plans are in the pipeline for Leadville later this year. Watch this space. Reload Espresso Bar is not only known for it’s bespoke coffee, but also for its breakfasts and lunches. It offers a menu appealing to everybody’s taste. The vegetarian, the healthy eater, the sweet tooth and the large appetite are all catered for. The diversity of the menu brings clients back repeatedly. Reload is known for a good few signature dishes which are both light on the pocket and the waist. Many of the dishes have a Mediterranean flavour which are not just delectable but also light and healthy. 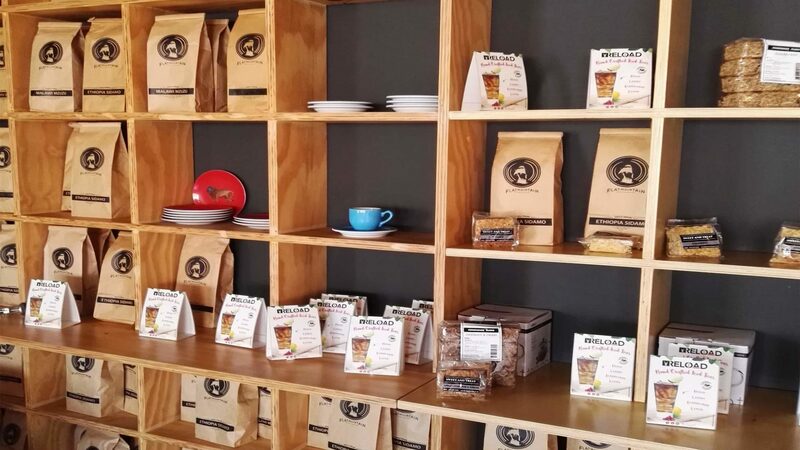 Reload prides itself on its bagels and seed breads that are made onsite in the central kitchen at Parklands Piazza and distributed to the stores at Flamingo Square and Leadville. One can buy these to take away. They are fresh and delicious. With only the freshest most wholesome and tasty ingredients used, Reload has put itself on the map as the “go to” Cafe. Kilaan, owner of the Reload Espresso Bars is a qualified and highly experienced barista who trains his own baristas in each store to pour coffee to perfection. He says it’s all about chasing the sweet spot. The timer is an essential part of the process. There are 12 steps that go into the making of a perfect cup of Reload coffee. Being a perfectionist, Kilaan makes sure that every barista goes through each step with precision. The aim is to draw 60ml of espresso in 25 seconds. To achieve this, one must have the grind adjusted accurately, whilst tamping with consistent and correct firmness. The resulting espresso is the base of every coffee. Differences in coffee type, e.g. cappuccino, macchiato or latte, are created by adjusting the technique in milk texturization and ratios of milk to coffee. Copyright © 2018 Reload Espresso. All rights reserved.